Before 1817: he starts his career in miyaji shibai as a disciple of the actor Nakayama Monjûrô, who gives him the name of Nakayama Jinkichi I. 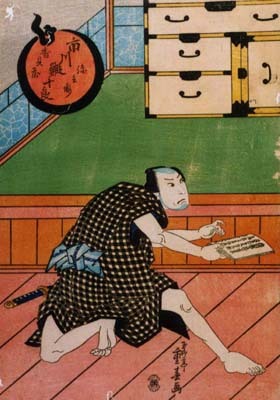 1817: he becomes disciple of Ichikawa Ebijûrô I and receives the name of Ichikawa Takijûrô I. 16th day of the 7th lunar month of 1827: his master Ichikawa Ebijûrô I dies. 24th day of the 11th lunar month of 1829: his master's son Ichikawa Ebijûrô II dies. 3rd lunar month of 1830: thanks to the patronage of the star Nakamura Utaemon III, Ichikawa Takijûrô I takes the name of Ichikawa Ebijûrô III at the Kado no Shibai, playing the role of Shioyaki Tôta in the drama "Mitsugumi Homare no Kagekiyo". He also plays the role of Manno in the drama "Ise Ondo Koi no Netaba". Summer 1831: Ebijûrô goes to Edo with Ichikawa Danjûrô VII. 1833: Ebijûrô goes back to Kamigata. 1st lunar month of 1836: Ebijûrô replaces Seki Sanjûrô II to perform in the drama "Hana no Ani Tsubomi no Yatsufusa", which is staged at the Naka no Shibai. 12th day of the 9th lunar month of 1836: Ebijûrô dies in Ôsaka. Ichikawa Ebijûrô III was a 19th century Ôsaka actor, who was able to perform a wide range of supporting roles, either as a tachiyaku or a katakiyaku. He did not reach the same level of fame as his master Ichikawa Ebijûrô I but his final ranking in the Kamigata hyôbanki was good, for it was only two little strokes below jô-jô-kichi.